When determining if a bull move in gold is a probability, a good indicator can be found in the relationship between the junior and senior gold miners ETF’s. If a bull move is occurring, the junior gold miners ETF (GDXJ) should show indications that it will outperform the senior gold miners ETF (GDX). This implies investors are willing to take on more risk in anticipation of greater gains by taking positions in the GDXJ verses the GDX. 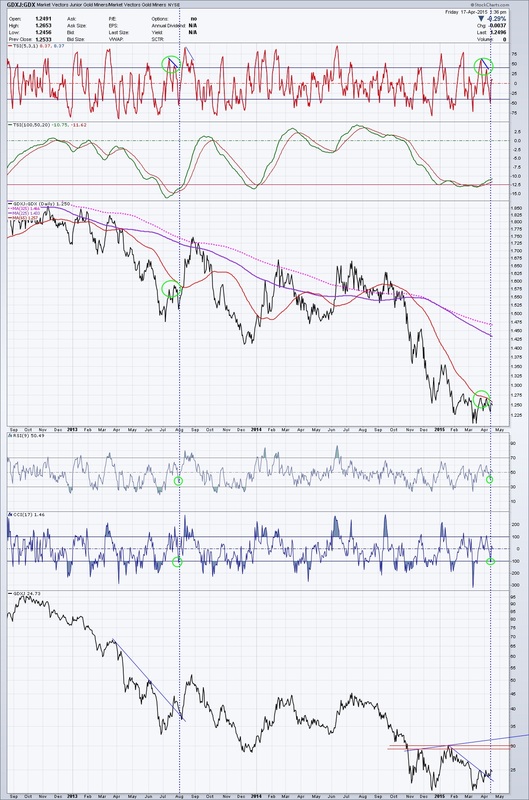 Recently, a pattern became noticeable in the GDXJ/GDX ratio if you take into account its momentum indicators that relates back to a prior short-term bull move during the summer of 2013. The ratio chart below highlights the similarities. The green circles show the similarities in the patterns, starting with the initial negative divergence that occurred in the short-term momentum (1st pane-red line), while the long term momentum (2nd pane-green line) was oversold. The following dip on short-term momentums (pane 1,4,5) into their oversold levels turned out to be the final low before resumption of the next wave up. The actual GDXJ chart is shown in the bottom pane. Note that the GDXJ/GDX ratio chart (3rd pane) rallied up to the pink and purple moving averages (in 2013) about 1 month later, so that is our expectation for the current situation with a possible 20% return as a target (GDXJ: $29~31) as highlighted by the horizontal double red lines in the GDXJ chart in the bottom pane. We would watch the price action on Monday, April 20 for a break above this week’s high for confirmation of this scenario. Alternatively, any move lower next week would be considered to negate any further bullish potential in the near term.